Here at Áiseanna Tacaíochta (ÁT), we dedicate ourselves every day to making true equality and independence the new reality for people with disabilities and their families in Ireland. Your donations mean that we can continue our vital work in giving the power back to people with disabilities so that they can take full control of their own lives, in many cases for the very first time. 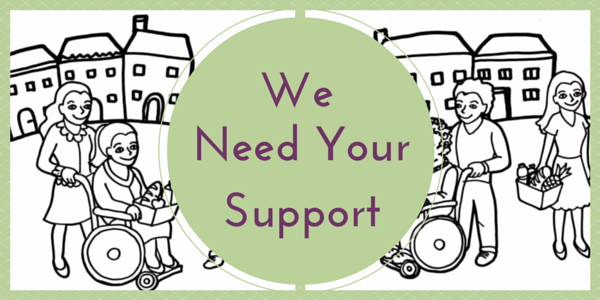 Every euro goes towards establishing Direct Payments for people with disabilities, providing essential services, training and advocacy supports, and running innovative programmes and events which strengthen disability inclusion and awareness across communities. Direct Payments mean that people with disabilities can choose everything for themselves, empowering them to pursue their ambitions and to live the ordinary, independent lives that we all want. Direct Payments are the difference, for example, between a college student being able to hire a Personal Assistant (PA) to start work at 7am so that they can make their lectures, instead of missing everything because they’re told they have to wait for one who starts at 10am. It’s the mother of a child with learning disabilities being able to buy an extra 20 hours of essential speech and language therapy for her son. It’s the friend being able to meet for that coffee or head out on that night, instead of being stuck home alone. These are small, normal choices with big consequences, but, shockingly, they don’t exist for most people with disabilities in Ireland. Your support will change that. This is a hugely important opportunity – will you be part of it? Your support means a huge amount to us. If you would like to donate online – whether that’s as a single gift or on a regular basis – it’s easy! You can donate quickly and securely through iDonate.ie – just click on the icon below to find out more or follow this link to access our donation form. Tax-effective giving means that the money you raise or donate to us at Áiseanna Tacaíochta (ÁT) can go a lot further: it turns your donations of €250 in a year into €362 at no extra cost to you, making a huge difference to us and the people that we support. Click here to find out more about how your money can go further with tax-effective giving. Our Annual Raffle gives you the chance to win one of ten fantastic prizes – including a trip for two to New York! Tickets cost just €2 each or €15 for a book of ten. Whether you choose to get in with your chance to win or volunteer as a ticket-seller, we’d love to have you involved! Click here to find out more about our Annual Raffle 2015. Corporate Social Responsibility (CSR) is playing an increasingly important part in many companies and organisations’ work, making a huge difference for non-profits across the country. A lot of organisations ask employees to nominate charities which they can support through different funding or donation schemes, and through volunteer programmes: you can help us a lot by simply finding out about your employer’s CSR policy and putting us forward for support! If you’re interested in supporting our work, online sponsorship is such a quick and easy way to get your own fundraising event going to do that, and to promote it with everyone who you think might like to sponsor you. There’s no end to the possibilities when it comes to your fundraising ideas. You can get sponsorship for nearly anything you could think of, and everything is made so quick and easy through iDonate.ie. Click here to find out more about how you can support us through online sponsorship.